Mission Beach and its surrounds has been renowned as home to artists and earthy creative dwellings. For decades, tucked into the rainforest, jewellery artist and cassowary conservationist Liz Gallie has been at the heart of this world of unique tropical art forms. In the mid 20th century, initial tourism popularity was sparked by international media coverage of the island lifestyles of two celebrated artists, renowned weaver, the late Bruce Arthur who set up an artist's colony on Dunk Island and colourful artist, the late Noel Wood who set up home on beautiful Bedarra Island. There was a very strong connection to the Victorian Monsalvat art movement with artists of renown such as (John Olsen, Clifton Pugh, and Fred Williams to name a few) who frequented the area to collaborate on projects with the island artists. alongside poet Judith Wright and scientist Len Web. 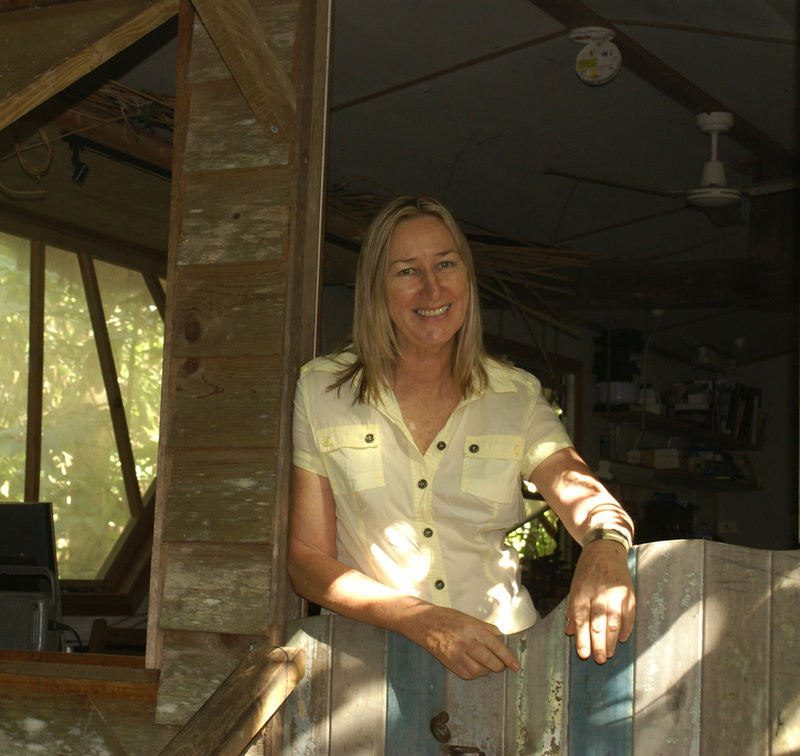 Liz Gallie, best known for her unique handmade jewellery made from local lawyer cane and precious metals, adopted Mission Beach as her home in 1974 after visiting what Liz terms "The most beautiful place I had ever seen. To those who discovered Mission Beach at a time when it was undeveloped except for farmland and one small motel, it was known as 'Mission Beach Magic'. 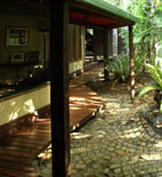 Liz purchased her free flowing timber Bingil Bay rainforest home, with adjoining studio straddling a gully, after cyclone Winifred in 1986. This quaint little home nestled amongst the rainforest has enjoyed a long history of artists in residence. "It belonged to a couple from New South Wales who invited artists to stay in the studio" Liz said. Next door, well known artist, the late Helen Wiltshire, opened her home as a gallery to showcase the work of a growing number of artists settling in Mission Beach, drawing inspiration from their rich tropical surrounds. At that time, the dense tropical rainforest, grew down to shade the long sandy beaches that stretched out in greeting to the offshore islands. The magnificent prehistoric cassowary wandered freely in its traditional domain and out onto the beaches. Liz's largely uncleared half acre block, situated next to a coastal stream, is frequented by the local cassowaries as they forage for native fruits. " I know the individual birds and am fascinated to watch how they interact with each other and raise their chicks," she said. "They can live to over 50 years old. 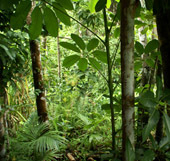 How many prehistoric wild animals can you share such intimate time with, to be able to observe their behaviour, knowing they have been walking and growing these forests for over 60 million years?" 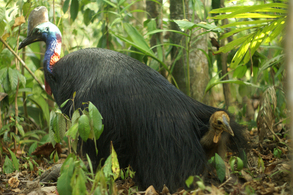 "Mission Beach has the highest concentration of cassowaries in Australia but 40% of habitat, essential to the cassowaries survival, is not specifically protected"
Liz has turned her artistic focus to environmental pursuits through photography and graphics, with a special concern for the endangered cassowary.